No Mascara a Trend for Spring 2010? I don't know about you, but I could not go without mascara. It is an everyday staple in my makeup stash. Some days I have forgotten to put mascara on, but I would always head to my nearest drugstore to pick up a tube. I just don't think that this is a trend that will catch on. I have seen some trends that I absolutely love, but this one...not so much!! While on the topic of mascaras. I have a question for all my (10) readers.....What is your favorite mascara? Also, do you think drugstore mascaras are better than high end? I personally love my drugstore mascaras, and I don't see the point in spending big bucks for something that I have to throw away in 3 months. I would rather spend my money on eyeshadow. 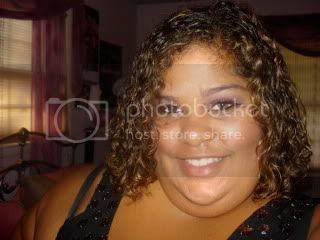 That's just me, what do you think? Hope you all are having an awesome weekend. For me its a laid back weekend with nothing really planned. 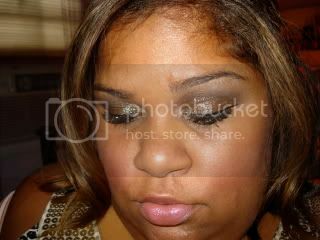 This past week I got a chance to finally check out the MAC Makeup Art Cosmetics collection. I know I am like a month late (not really), but I just got the funds I needed to buy things. I knew from looking at specktra that I wanted the Photo Realism quad and Fuchsia glitter. 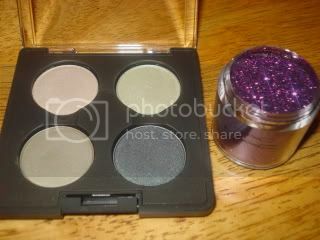 I also wanted the Violet Trance eyeshadow, but when I swatched it, the color was kind of chalky and not very pigmented. I had heard that you have to work with this shadow to make it really show up. I still may pick it up at some point, but for now I left without it. I just picked up what I planned. Here are some photos of both of these items. I really like both of these items. When I first used the quad, I honestly thought I was going to be returning it. I just was not impressed initially. I had seen all these great looks with the quad, so I was dissapointed that I didn't like it. Today I decided to give it one last shot, and I am glad I did. I made a complete 180, and the quad has grown on me. I'm not really used to wearing green eyeshadows, but its growing on me. Even though, I don't really consider this quad to be true green colors. I used the shadows in a different way than I had at first, and that made the difference. The colors are really pretty, and I can't wait to do a smokey eye with the quad. 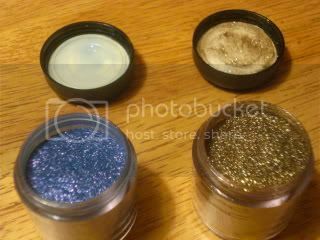 As for the glitter, I have not used it yet. I do love the color though. The only problem I have with it is that I do not understand the name. The glitter clearly is not a fuchsia color. It looks completely purple to me. 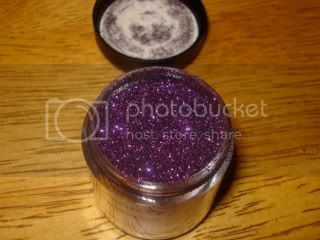 I think MAC missed the ball with this one with not naming it purple glitter. I think its going to be fabulous for a night out though. 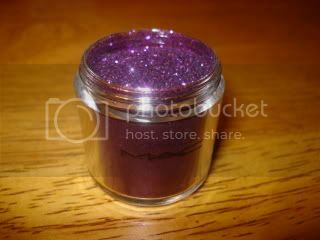 Its a great glitter!! This collection was huge, as most of the MAC fall collections are. There are a couple of things I still want from this collection, so I'll be back with another haul soon. Its time again for Ins and Outs. Its a little late now that August is over, but better late than never. So here it comes. Fall TV Premiere's: I for one am a Grey's Anatomy fanatic, and I'm so excited about it coming back for its new season soon. There are also several other shows that I am excited about, but its too much to list. Don't get me wrong I'm sad to see summer go, but fall represents my favorite shows are coming back on. Pink Lipsticks: Pink has become my go to color for lips. My lipstick collection is just beginning to grow, as I used to be strictly a lip gloss girl. 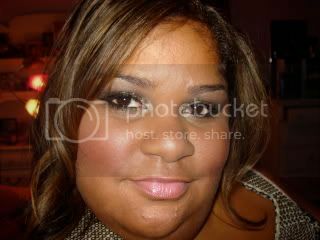 I love the look of smokey eyes, and light pink lips. Its hot!! Style Black Collection: This collection of all things black looks amazing. 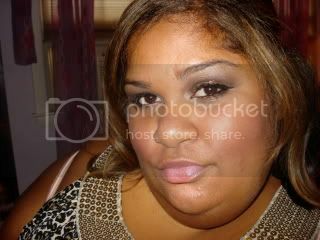 Now, not the black lipstick but the eyeshadows look great. I must pick up that purple eyeshadow Young Punk. Also, Volcanic Ash Exfoliator is coming back, and I will not miss out on it this time around. The visuals are stunning for this collection. It's gonna be a hot one!! Summer: So sad to see summer go. It was a great one! That's it for now. I racked my brain to think of more outs, but I couldn't think of one thing. I'm thinking I may change this up to "Favorite Products of the Month", or I may do both. Haven't quite decided yet. How has everyone been? Its been a busy couple of weeks for me. I've started grad school, and between that and my everyday job I have been super busy. I went to the CCO a couple of weeks ago, and picked up a couple of things. 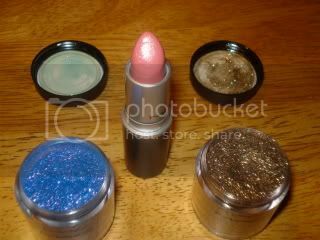 I got two glitters and a lipstick. Reflects Antique Gold: I absolutely love this glitter. The color is described as a Sparkling taupe, and it is absolutely gorgeous. I use this in two different ways. 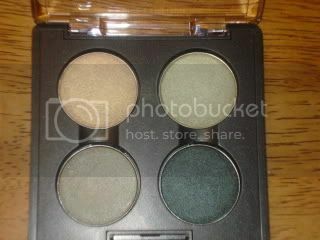 One as an eyeshadow, which I'll post as a FOTN later on in the post. Also, I can use it with lotion, and it makes my skin sparkle. Reflects Purple Duo: This color is described as a sparkling rich purple, but it looks more blue to me. I haven't had a chance to use it yet, but it is a pretty color. I'm thinking that I am going to use this with Cobalt eyeshadow. I don't know yet. Later on that night after my trip to the CCO was my dad's birthday party. 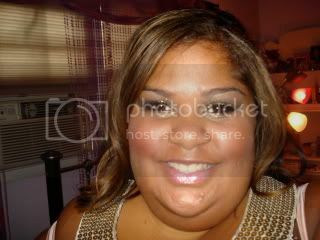 I used my new products for this look. 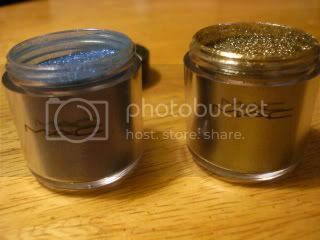 I got the idea for the eyeshadow from itsjudytime on youtube. I really like how this turned out. Thanks for looking!! This was one of my longer posts, as I didn't want to separate into two posts. I have some great posts lined up for the next couple of days. Up next is Ins and Outs #2! !